After a few good years of city life, Jordan Poteet returns to his small hometown of Mirabeau, Texas, to work as a librarian. Yet his quet domesticity is shattered when he locks horns with Ms. Beta Harcher, the town’s prize religious fanatic, in a knock-down drag-out battle over censorship. When Jordan finds her murdered body in the library, he learns that Beta dead is much more dangerous than she ever was alive. Not only for poor Jordy, whom the police are itching to throw the book at, but for countless others. 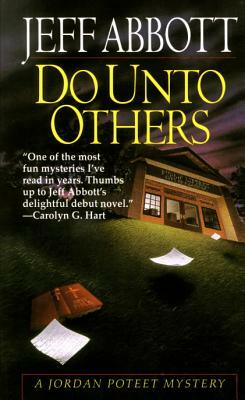 In fact, thanks to a cryptic list the police find stashed next to her fanatical heart, Beta Harcher has the whole town in a death grip. . . .
Jeff Abbott is the nationally bestselling, award-winning author of six novels of mystery and suspense. His novels have been called "exciting, shrewd, and beautifully crafted" (Chicago Tribune), "fresh, original…intricately woven" (Publishers' Weekly), and "excellent" (South Florida Sun-Sentinel). A fifth-generation Texan, he spent his childhood in Austin and Dallas with parents and grandparents who loved to tell stories.